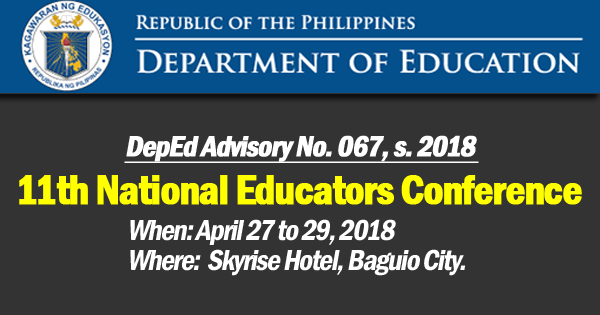 The Association of Science Educators in the Philippines (ASEP) will conduct its 11th National Educators Conference with the theme Science and Technology Advancement Through Enhancing Capabilities of Educators Focus on Inventions, Research and School Leadership from April 27 to 29, 2018 at the Skyrise Hotel, Baguio City. enhance their capability in research with focus on Science Intervention Materials (SIM) and Qualitative and Quantitative research. The target participants are chiefs, education program supervisors I and II, schools district supervisors, school principals, school heads, teachers in Science, English, Mathematics, Filipino, Social Studies, Values, Music, Arts, Physical Education and Health (MAPEH), Technology and Livelihood Education (TLE), Research Guidance coordinators, advisers, master teachers and key teachers from both public and private elementary and secondary schools.